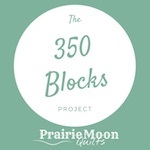 This year’s Sew Sweet Saturday Sampler Club Block-of-the-Month is happening now! 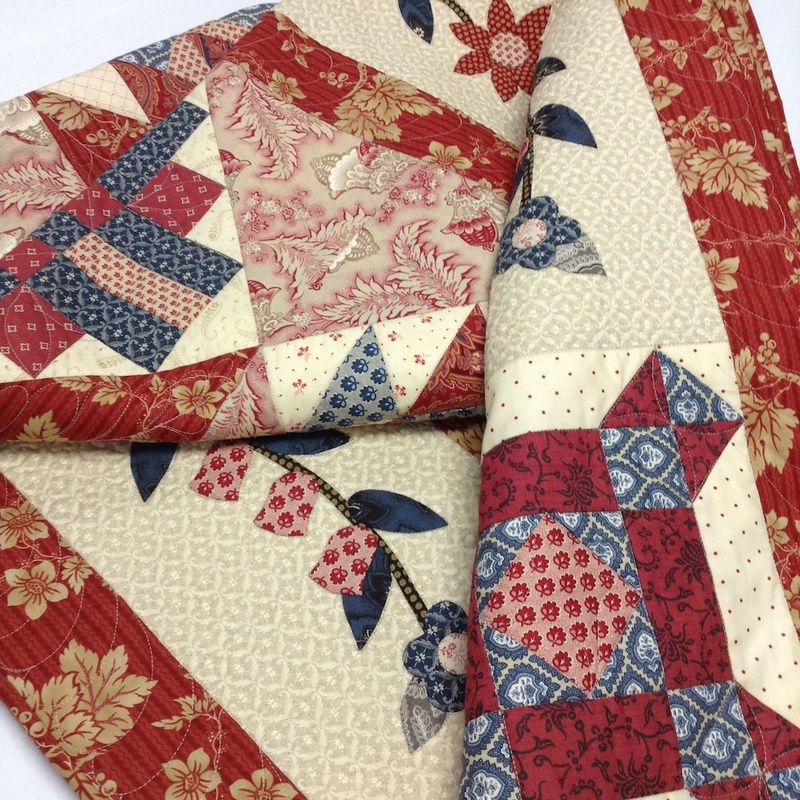 I’ve been working really hard on these three quilts and the pattern booklet for them, and tomorrow is the big day! 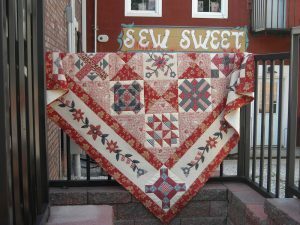 Sew Sweet Quilt Shop is presenting these quilts as their annual Saturday Sampler Block-of-the-Month, and the first installment happens at tomorrow’s event at the shop. 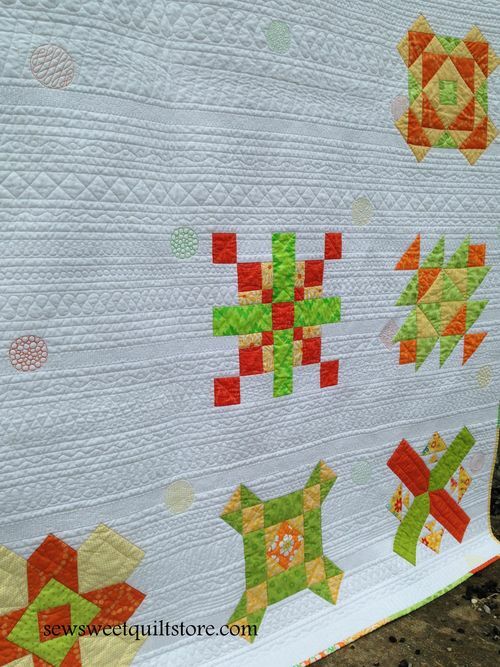 Here are the quilts . . .
All three quilts have the exact same 12 blocks in them, and you get to decide how you want to put them together. 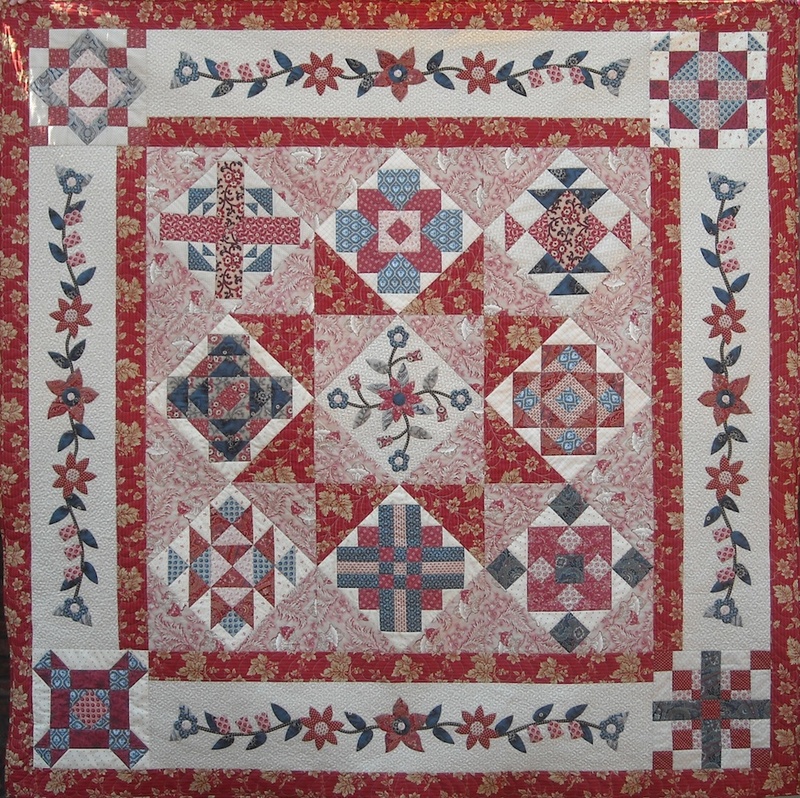 The French Country Sampler has all 12 blocks in a medallion-style setting. 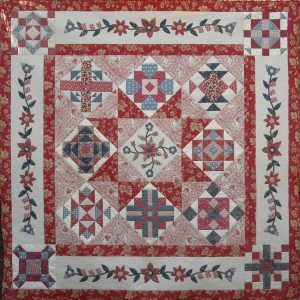 The red version has an applique center and applique in the borders. 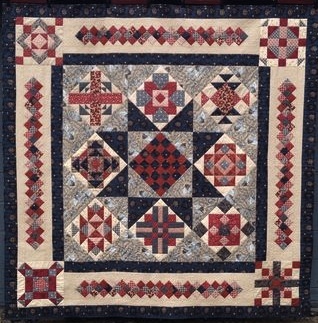 The blue version has a pieced center and pieced borders. 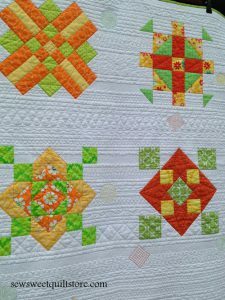 The settings are interchangeable, so if you want to make the red one with the pieced setting, or the blue one with the applique, you can! 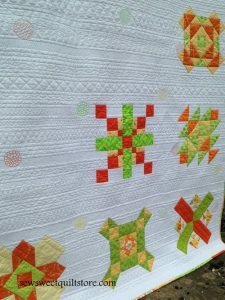 All three patterns and settings are included in the booklet. 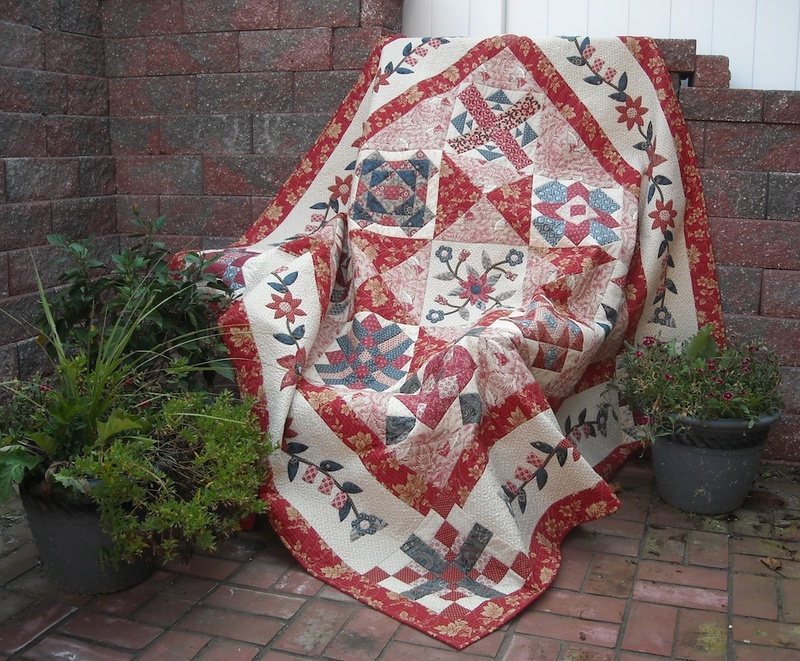 Thanks to my personal photo stylists, Barb and Alice, I got some really pretty shots of the red quilt. I stole a lot of the other photos from Jessica at the shop. 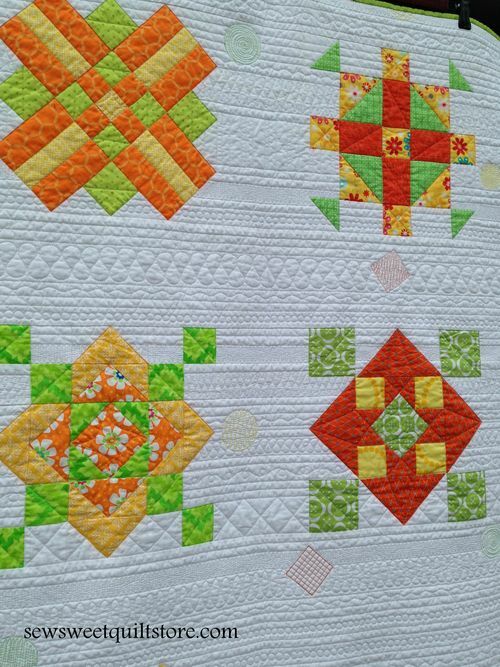 Here’s a couple close-up shots of the quilting on the modern version. There was a lot of negative space to play with. 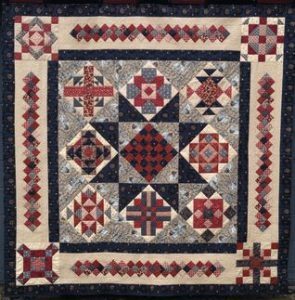 I pulled the colors from the blocks, and put a few random spots of color into the quilting, just for a little added interest. 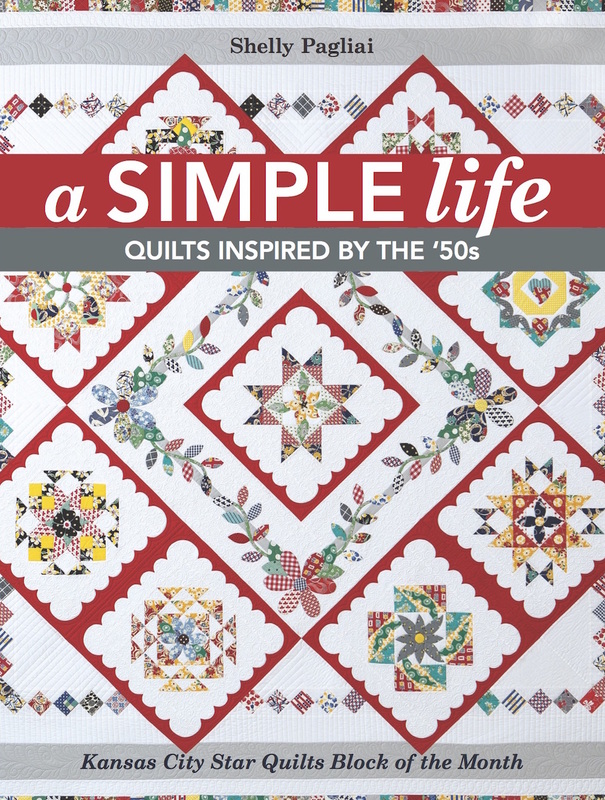 The 92-page booklet contains all 12 block patterns, applique instructions, piecing instructions, setting instructions for all three versions, and some little extras I hope you’ll enjoy. 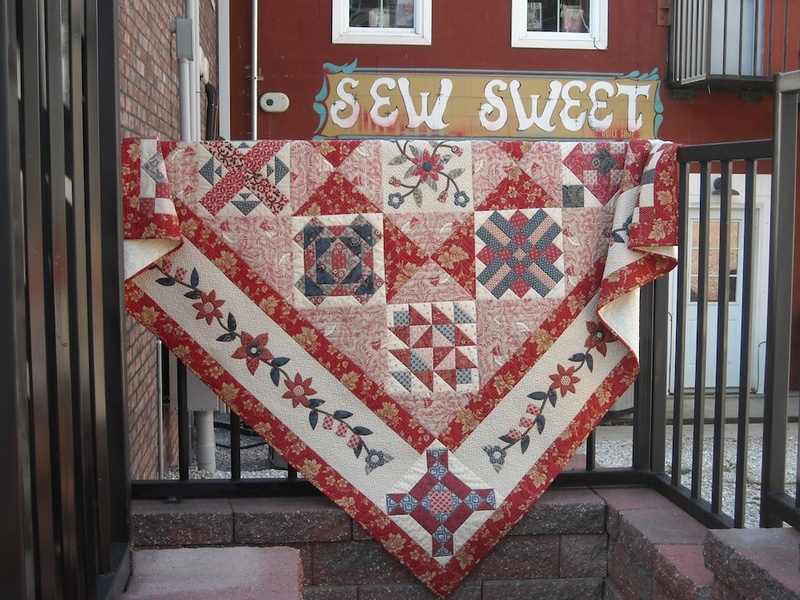 The pattern booklet is available only through Sew Sweet Quilt Shop. 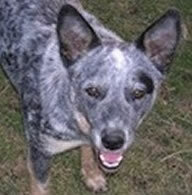 You can give them a call at 660-548-3056 to get your hands on it. 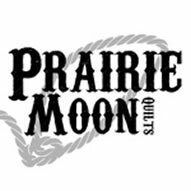 They’d be glad to sign you up for the Saturday Sampler Club, or ship the pattern booklet to you. 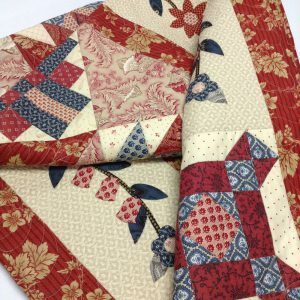 Better yet, come on down to Sew Sweet Quilt Shop in Brunswick, MO, tomorrow, and pick yours up in person; they’ll be showing off what else is new at the shop this month. I’ll be there, too, so come say hi! Those are awesome Shelly! You really out did yourself. U bet they will be a big hit. Oh my goodness, they are all gorgeous! How do you ever find the time and energy to get so much done?! Congrats!! Seriously, they are gorgeous. I’m especially blown away by what a difference color and placement makes. 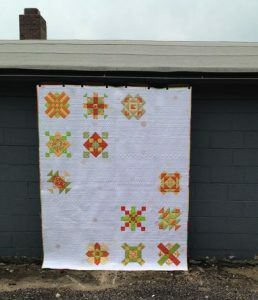 Hard to believe the French Modern Sampler has the same blocks as the other two. they are all lovely! 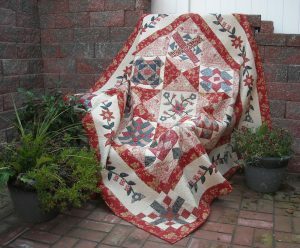 So, did you finish the wedding quilt in time?? Congratulations on those three great designs. I’d jump at the chance to make the red one if I wasn’t so inundated with WIPs and other things. There are so many great ideas out there. I’m sure this one one will be a great success. Wish I could come see them in person tomorrow. Each one appeals to me on a different level. These are just so incredibly beautiful. I love the red/white/blue version the best.